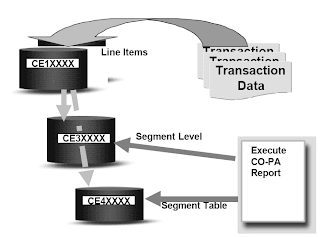 The lowest level from which the application reads data is the of the segment table and the segment level. This level contains the data from the line item in a primary summarized form. The segment table contains the profitability segments and their characteristic values. the segment level contains the value fields for the profitability segments and the characteristics of time. Storing historic data: If you no longer need the origin information for data from previous periods, you can archive the line items and retain only the segment level. When defining a report in reporting, it is necessary to specify whether a report should continue with execution if it cannot find a suitable summarization level (which could take some time), or whether it should continue executing with a warning that it could take some time, or if it should stop executing. It is also necessary to define whether a report should access the data from a summarization level alone, or whether it should read current data, requiring the addition of data from any line items that have posted since the level was last updated. Other CO-PA functions automatically access current data. 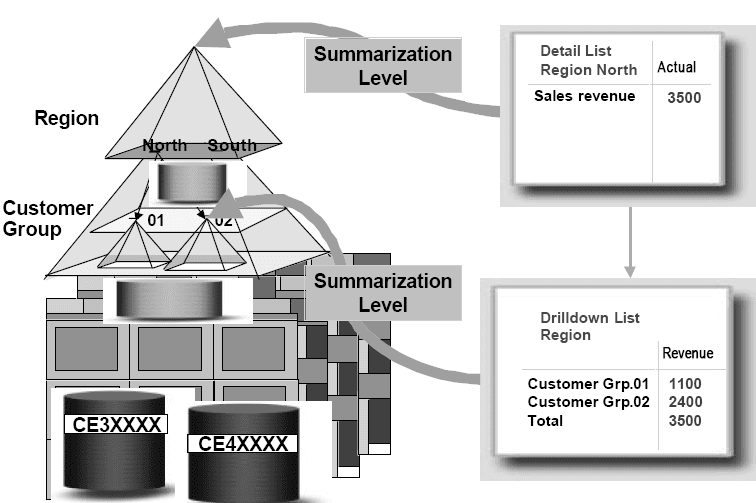 Each summarization level is physically two tables in the database, a key table and a summary record table, which act like the CE4… and CE3… tables in costing-based CO-PA. It's possible to analyze statistics on the levels in configuration to determine whether they are efficient or not (how many times they are being used by CO-PA functions, and their relative size compared with the std summary table). Performing a realignment on CO-PA data automatically invalidates all the data that had been previously summarized in the summarization levels. After a realignment has been performed, the summarization levels have to be filled (rebuilt) from scratch again, rather than merely updated. 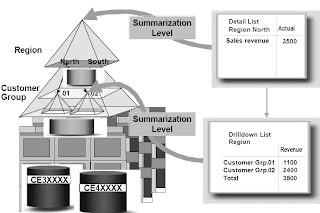 Summarization data refers to a set of summarized data for a specific report. When a report that has existing summarization data is executed, that summarization data is accessed and then actualized (meaning 'updated') with the information that has been posted in line items since the last time the report was executed (if current data is desired). The report output shows the new summarization data. Summarization data is usually more efficient than summarization levels for a specific report (if a report is executed frequently), but it is less efficient for the system overall, as each set of summarization data can only be used to enhance the performance of only a single report. Therefore, it is not recommended to have summarization data for many or all CO-PA reports. When defining a report, it is necessary to specify whether that report will access summarization levels or whether it will use summarization data. Within an operating concern, it is possible for some reports to access summarization data and for some to access summarization levels. It is also necessary to specify the system reaction when no summarized data can be found during report execution. 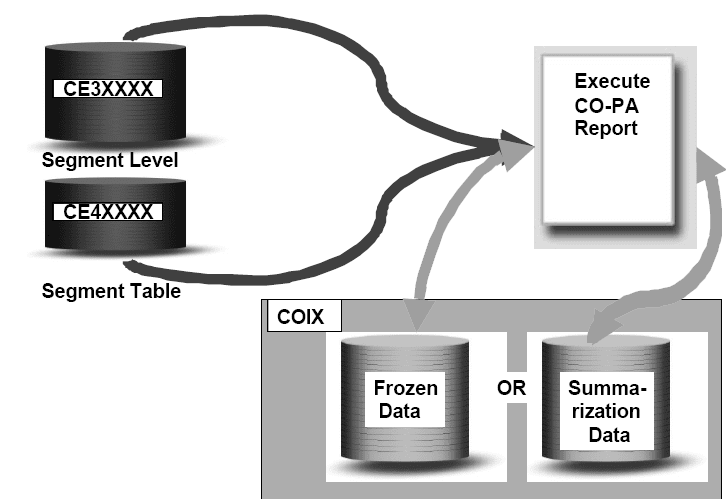 Frozen data refers to data stored for a specific report and a specific set of variable values at a specific point in time. There can only be one set of frozen data for each combination of these. Frozen data, like summarization data, is valid for only a single report; the difference is that frozen data cannot be actualized. Frozen data is literally a snapshot in time of report data, which may have been generated directly from the database, or utilizing summarization data or summarization levels.